After Biden’s comment about Obama being tested within the first six months if elected, I noted that the vice presidential candidate mentioned Kennedy – most likely referring to the Cuban missile Crisis – but didn’t mention other more recent presidents that were tested. Bush (43) was tested within nine months with direct attacks on this country, but Ronald Reagan didn’t need to be tested, the Iranian mullas knew exactly what he was made of and they were not going to mess with him. Investor’s Business Daily has an editorial on the subject today. An early sign of the coming greatness of the Reagan presidency was that within an hour of the former actor’s taking the oath of office, the Ayatollah Khomeini’s Islamofascist regime in Iran released the 52 U.S. hostages it had been holding for 444 days. Somehow, Ronald Reagan’s lack of foreign policy experience didn’t give Tehran the impression it would be a good idea to find out what he was made of; the mullahs already knew. Hot Air has more. Malkin has the Stupid Statements and Gaffes Biden Review post for the week. Someone should write a book. Predictions? 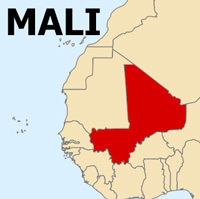 Could Mali be the next terrorist stronghold? It will be an answer to "Allah's" prayers if Obama wins. Kennedy is the most overrated US president and would be kicked to the curb like Liberman was by the Dem's if he was a Dem today.